This morning I had a brawl with mummy. Mummy had given me my breakfast and brushed my teeth and got me dressed, and then she sat on the bed in my nursery and asked me to bring her my hairbrush. This happens every morning, and normally I am happy to go and get my hairbrush from the shelf that it lives on, and to bring it to mummy so that she can make my hair fluffy … but today it occurred to me that maybe mummy should stop being so lazy, and get the hairbrush herself if she wanted it. So I shook my head and said “no”, very seriously. Mummy put her stern face on and told me that if I didn’t bring her the hairbrush, then I would have to sit on the landing. I thought about this and decided that it would be better to sit on the landing than to let mummy win the brawl. So I shook my head again, and mummy put me on the landing and left me there for a bit of time. While I was on the landing, mummy went back into my nursery and kept the door shut behind her, and I knocked on the door with my hand and made dog noises. I kind of thought that mummy might laugh at this, because it is usually very easy to make her laugh, but if she did then it was a very quiet laugh that I couldn’t hear. Then mummy opened the door and let me come back into the nursery, and she asked me if I wanted to get my hairbrush yet. I didn’t, so I said “no” again, and mummy put me back on the landing. This happened many times, and in the end I realised that I was going to have to be the sensible one and go and get the hairbrush, because mummy was far too stubborn and lazy to back down. And also, I was getting bored by this time. Anyway, after I had finally had my hair made fluffy, the day became much more fun. Mummy packed me and my things into our car and we went to pick up her friend Heidi, who lives near the beach. Then me and mummy and Heidi went to the beach to play, and we had a lovely time. First we went to a café for lunch, and then we went for a walk by the water, where the wind was very blowy. Then we went down onto the sand and Heidi made a bridge and I squashed it. While Heidi was making her bridge, mummy was digging a hole in the sand. Heidi helped her by finding a plastic lid that had come off some kind of tub, and giving it to me so that I could scoop sand out of the way. I didn’t know what the hole was for, until mummy picked me up and put me inside it. Then I realised that she wanted to bury me!! For a moment I wondered if this was about the hairbrush brawl earlier, but then I decided that it was probably just because mummy is strange. Mummy filled the hole back in with sand that covered my legs and went all the way up to my tummy. Then I had to kick my legs hard and shake the sand off me to escape. We did this a few times until mummy and Heidi got bored, and then they decided that we should walk some more. I didn’t really want to come away from the beach, because I was having fun playing with the sand and getting buried, so I shook my head when mummy said that it was time to go, and sat down on my bottom and refused to move. But then mummy and Heidi walked away up a path and I couldn’t see them any more, so I thought I had better follow them in case they left me there and forgot to come back and get me. Mummy put me in my pram after this and I must have fallen asleep during the walk, because the next thing I remember is being put back in the car ready to go home. We dropped Heidi off at her house, and then me and mummy went home to find daddy. I was very hungry after this very busy day, and I ate all of my dinner up very fast. When I was getting ready for bed, sand kept falling out of my clothes and I made a nice pattern of it on the carpet for mummy to clean up. She will have to do this when I am sleeping. It will serve her right for burying me earlier. Today I went to my first party where I had to wear a “cos-tume”. It was my friend Jackson’s birthday and he was having a party for being two. Daddy came home from work in the morning because he had been working in the night time again, and he stayed up and played with me and mummy because now he is not going to go back to work for a few days. He was very slow and dozy, though, and he kept lying down on the floor and falling asleep. When he did this I had to climb on him and pat his tummy and say, “Dad-dee! !” to wake him up. Mummy found this very funny. The parent staff took me to the big shop to get some food, and some new pretty dresses for me because I am getting too big for my other dresses. One of my new dresses has an owl on it. Daddy wanted to buy it for me because I can say owl in the staff language – “ow-ul” – and he thinks that this is wonderful. While we were in the big shop I was in the trolley seat, and it was boring so I kept pulling mummy’s finger and saying, “Walk! Walk!”, but mummy would not let me get down. I think that this is because last time mummy let me walk around the big shop, she gave me some bread to hold and I ran away out of the door with it, and mummy said that I was “shop-lifting”. I am not sure what this is but it must have been bad, because after mummy had caught me again her face was very red, and she has not let me walk in the big shop since this day. So I stayed in the trolley seat, and daddy took us for food in the cafe upstairs. I stole some of daddy’s toast, which was very nice. Then we went home and I played and had a nap. After nap time, mummy woke me up and told me that she needed to put me in my “cos-tume”. I was going to be a “pi-rate”, and I had jeans and a stripy T-shirt, and cool boots and a hat that daddy had made for me. Mummy and daddy both said that I looked very cute when I was all dressed up. Mummy put me in her car so that she could drive me to the party, and daddy said goodbye to us and went upstairs to bed because it was time for his nap now. The party was in the house where Jackson’s nanny lives, and when we got there, Nic was waiting to say hello to us. Nic is Jackson’s mummy. She told me that I looked very good in my “cos-tume”. Nic took us to play in the garden, where there was a bouncy castle and a sand pit. This was very good fun. I went on the bouncy castle with mummy and Jackson and another little girl who was the same size as me. Then I went to play in the sandpit, and I got my hands very dirty and wiped them on mummy. After this, everyone went inside because it was time for food. We had some very nice party food on a special plate, and mummy let me have some “sausage roll”, which I have never had before. Then I played with some “ball-oons” and some of Jackson’s toys. There were lots of grown-ups at the party and I was a little bit frightened because they were all very big and I am very small. But I found that if I took mummy with me when I wanted to go somewhere new, it was not so scary. After I had played for a while, everybody went into the living room and Nic shut the curtains and made it all dark, and then she brought in Jackson’s “birthday cake”, which looked like an island with treasure on it. Then she lit some little candles on the cake and asked Jackson to blow them out. While Nic was lighting the candles she said, “Ready ... Ready ...”, and this is a word that I know in the staff language, so I said “READY!” very loudly, and everybody laughed at me. Jackson blew out his candles and everybody sang a song and clapped, and I clapped too. Then Nic brought me a piece of “birthday cake” and asked mummy if I was allowed to have some. Mummy has not let me have cake before. Usually she tells me that it is “grown-up fruit” and that I am not allowed it, but really I think that she just wants to eat it all herself because she is greedy. Today, though, mummy let me have a little bit of cake, and it was really nice. I think that mummy is mean for not letting me eat cake before now. Soon after this, mummy had to take me home, so we gave goodbye kisses to Nic and Jackson, and mummy said thank you to Jackson’s nanny for having us. Then mummy drove us home to daddy, and the parent staff started to get me ready for bed. Just before my bedtime, Auntie Al arrived at our house with Sammy, who is her “boy-friend”. A “boy-friend” is a bad person who daddies want to shoot. I know this because that’s what my daddy told me. Daddy says that if I ever get a “boy-friend”, then he will shoot him. Sammy does not seem very bad though. I like him and I think it is nice when he comes to visit me. Auntie Al and Sammy came to listen to my story tonight, and to give me kisses when daddy lifted me into my cot. I hope that they will still be here when I get up to play tomorrow. I have had an exciting day today. When I am two, I will have a party and there will be lots of cake, and mummy will not be allowed to eat any of it. For some reason, I have had a lot of rage today. I don’t really know where it came from, to be honest. It wasn’t there when I got up this morning. This morning I woke up in a lovely mood, and I played in my cot with my books for ages before mummy came in to get me. Then we went downstairs to see Uncle Ben and his big red eyes, which he said were feeling lots better today. Granny came round quite early in the morning. She was going to pick Uncle Ben up and take him back home with her so that he didn’t have to take his big red eyes on the train. While Granny was with us, we sat in the living room, and since the grown-ups were talking I got bored and decided that I needed mummy to come for a walk with me. So I got hold of her finger and said “walk”, and then I led her to the kitchen and we stood and stared at the fridge for a while. Then mummy said that we had to go back into the living room ... but back in the living room the grown-ups were being boring again, so I tried to take mummy for another walk. Mummy was very awkward about this and she told me that she was talking, and she didn’t want to go for a walk to the kitchen just to stare at the fridge. This made me cross, so I stood in front of mummy and cried loudly and squeezed out some rage tears. When mummy asked me to stop crying I cried louder, because she was annoying, and mummy pointed up to the stairs and asked me if I wanted to go into “time out”. I didn’t want to go into time out so I stopped crying, but I did not forget that I was cross, or that mummy had been bad. Daddy came home from work not long after that. At the moment daddy is working in the night time, and this is why he came home from work in the morning. I ran to daddy and gave him a big hug when he came through the door, and I wanted to tell him all about how cross I was ... only I didn’t know enough words in the staff language to make him understand how bad mummy had been. Soon after this, daddy went upstairs to bed and Granny and Uncle Ben went away, so mummy put me in the car and took me to the park to play. I fell asleep in the car and when I woke up, a lot of my rage had gone. I had a nice time playing in the park with mummy. We collected some baby treasure (one of my treasures was an empty crisp packet and mummy wouldn’t let me keep this), and we went to say hello to the ducks. The ducks were very pleased to see us. When we got home, mummy let me paint again and I made some lovely pictures by putting my whole hand into the paint dish and then wiping it across the paper. Mummy told me that I am “talented”. After mummy had made us clean again (which took quite a long time), we went upstairs to jump on daddy and wake him up. Daddy was very pleased to be woken up so that he could come and play with us. We played downstairs and I could feel my rage starting to come back again as it got closer to dinner time. I was getting tired of the parent staff bossing me about, so I said “no” to lots of things that they asked me to do, even if they were things that I actually wanted to do (like helping to feed Harvey). I hoped that this would teach them a lesson, but sadly it didn’t seem to. At dinner mummy had made me a “curry” that she said was very nice, but actually it tasted yucky, so I spat lots of it out. Auntie Beccy had come round to watch me eat my dinner, and she had to be serious and tell me that I was naughty to spit out my dinner, but really I could tell that she wanted to laugh. When it was my bath time Auntie Beccy was going to go back home, and daddy told me to give her a kiss goodbye. I said “no” to this, because of my rage, and then the grown-ups all said goodbye to each other and I decided to give Auntie Beccy a kiss after all because I didn’t want to be left out. During my bath time I had more rage, because daddy was trying to read me my bath story and he was doing it wrong, so in the end he gave up and told me that I wasn’t having a bath story tonight. I had rage when I got out of the bath, too, especially while mummy was drying my hair with the towel. Mummy and daddy were very stern with me and they told me that my rage had to stop before I could have my milk. My milk was nice and it made a lot of my rage go away. When they put me to bed tonight, mummy and daddy asked for me to have less rage when I get up tomorrow. I will see about this. I think that I will sleep well tonight, because all of the rage has made me very tired. When I got up this morning, Uncle Ben was in my house. He had come to stay with us because he was having his eyes “lay-sered” near to where we live. Early this morning daddy got up and took Uncle Ben to the place where the “lay-sers” are. The “lay-sers” will stop Uncle Ben from having to wear glasses like mummy does. Mummy wears glasses and they make her look like an owl. Me and the parent staff went to pick Uncle Ben up from the “lay-ser” place a little while later. Uncle Ben was wearing dark glasses and under the glasses his eyes were pink and strange-looking. When we got back to our house, he had to lie down in the dark and mummy had to squeeze drops of weird stuff into his eyes out of little bottles. The parent staff took me out to a cafe for my lunch, and I ate a very nice toastie and had a strawberry milkshake. Daddy likes to buy me strawberry milkshakes as a treat when he takes me out, and I think that this is a good idea. When we got back home from the cafe, grandad arrived in a car that he had brought for mummy to drive. Mummy’s old car is the one that did not do well in its “M-O-T”, and now it is dead. I am not very sorry that it is dead because I hope that the new car will be cleaner and not as embarrassing as the dead one. We took grandad with us to the park for a walk. Only I wasn’t walking and neither was daddy. Daddy was riding his bike and I was in my special seat on the back of the bike, wearing my cool helmet which has flames on it. I really like being on the bike; it is fast and fun and I can see lots of dogs and talk to them as we go past. Also people point at me and say that I am cute, which is always nice. After the park we went back home because grandad needed to go back to his own house, where gran is. While mummy took grandad away in her new car, I stayed at home with daddy. Daddy wanted to do something messy so he decided that we should paint. He wrapped me up in my Pooh Bear overalls and put paper down on the table so that we wouldn’t make a mess where the grown-ups eat their dinner. Then we made lots of pretty pictures using my paint brushes and my nice bright paints. We were very kind and we made pictures for other people as presents. Our best one was a picture for Uncle Ben which was of his scary red eye, after the “lay-sers” had got it. When mummy got back home we opened the door for her, and I showed her my hands which were all blue with paint. We showed her our pictures as well, and she laughed at the eye one and said that daddy is “warped”. Daddy tidied up all of my paint things while mummy made my dinner. I was very good and I ate all of my dinner tonight without spitting any of it out. I was feeling very hungry, because I hadn’t had any snacks this afternoon. At bedtime I was very droopy and yawny, because I hadn’t had a nap all day long. I put my head on my pillow and didn’t paddy at all when mummy and daddy said goodnight to me. I am feeling happier about bedtimes now. Even though the parent staff are mean and put me to bed while they stay up and play, they always come back for me in the morning time. I am feeling a lot better today than I was on the sick day. I still have a very runny nose, and mummy keeps wiping it with tissues (which is really annoying), but I am eating lots as usual and I am enjoying playing again. I have done lots of playing today, but I have only had mummy to play with because mummy wouldn’t take me to see any of my friends. This is because she says that I might still have “germs”, and if I give my “germs” to my friends then they might be sick too. I wouldn’t want my friends to be sick. Being sick is not nice. As mummy did not have to go to work today, we were able to take a long time having breakfast and getting washed and dressed. This meant that while we were in my nursery picking my clothes for the day, I could pull books down off my bookshelf and throw my cuddly bears around the room, and mummy would not mind as much as usual. I decided to make the most of this, and I made a large amount of mess. When we were dressed and mummy had made my nursery tidy again, we went downstairs so that mummy could do some jobs, and I told her off and bashed her with books that I wanted her to read to me. For lunch today mummy made us both some poached eggs on toast, because she said that it was a day for “comfort food”. I enjoyed my poached egg. A lot of it ended up on my face. After lunch we went to the park. Mummy packed us some treats in her bag and pushed me in my pram. I fell asleep on the way to the park and when I woke up, I was still in my pram and a big dog was running towards me. The dog was being chased by a lady who was shouting. Mummy was sitting on the grass, and when the dog ran over to my pram she stood up and told him to go away. Mummy is a spoil sport. I said “wuffwuffwuffwuff” to the dog, which meant “stay here and play”, but the dog’s mummy sounded cross so he went away with her instead. After that I got out of my pram and sat on the picnic blanket with mummy. I raided mummy’s bag and found snacks and books. I ate the snacks and then I put the books into my pram and took them for a walk. Then I got hold of mummy’s finger and said “walk” and took her for a walk as well. While I was walking mummy, I found some nice big yellow flowers and I stuck my face in them and sniffed them. After a while mummy took me away from the flowers because there were lots of bees in them and mummy said that I shouldn’t sniff bees. I wonder why I shouldn’t sniff bees. Maybe they don’t smell very nice. When we had been in the park for a long time, and I had had a go on the swings and read some books with mummy, I got back in my pram and we came home. 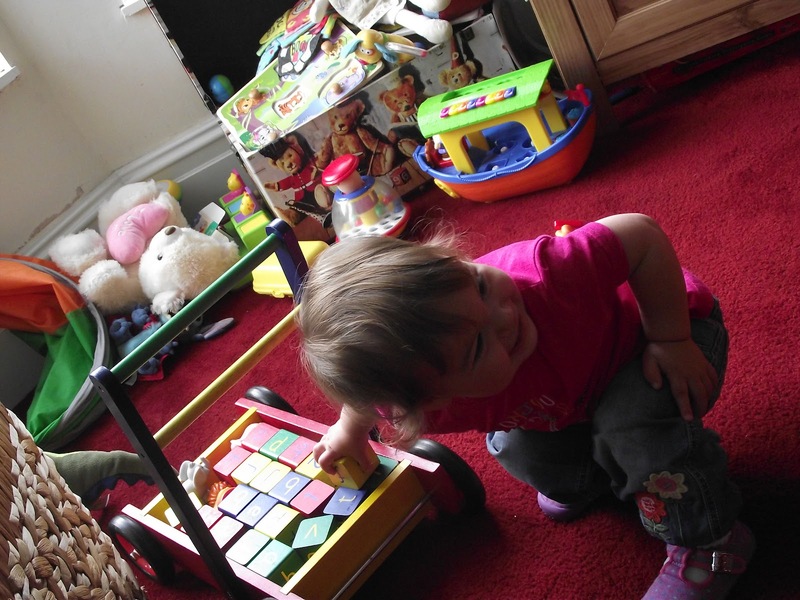 We sat in the living room and I played on my slide and threw bits of my jigsaws around the room. After this daddy came home, and I was very excited to see him. It is a bit boring seeing just mummy all day long. Daddy played with me while mummy made my dinner, and then mummy tried to feed me my dinner and I only wanted to eat a little bit of it because I wasn’t very hungry. Mummy was quite cross about this. I think she was mostly cross because I was opening my mouth for the dinner, but then spitting it back out down my bib. Mummy does not like it when I spit. The thing is, though, I have found that if I say “no” and do not open my mouth for dinner when the staff try to feed me, then this makes them cross as well. Sometimes I just cannot win with these people. Mummy had forgotten to be cross by bath time, and daddy gave me a nice bath and a story, and mummy cuddled me while I had my milk. The parent staff were a bit worried that I might be hungry in the night because I didn’t eat my dinner, but I won’t be. My tummy is nice and round, and full of poached eggs and snacks. I am not well today. The grandparent staff have been looking after me while the parent staff have been at work, and I have had a runny nose and a cough, and sometimes when I speak I sound like a very old man. Everyone has laughed about the old man voice but it is not funny. They should be more worried about me at this sad time. I had a nice day with the grandparent staff, but I felt very tired and I didn’t want to tease them as much as I usually do. I also didn’t eat many snacks, which is strange because normally I want to eat snacks all day long. The grandparent staff took me to “Dobbies”, which is a place we have been to before. It has lots of plants and lights and toys and all sorts of other things, and there is also a bit with fish in big tanks. We went to look at the fish and grandad lifted me up high so that I could talk to them. When we had finished at Dobbies, grandad took us in his car to the “air-port” to collect my other granny, who has been away to a hot place. Granny was very brown and she had brought me back a sparkly tortoise that lights up and changes colour when you press a button under its tummy. It is cool. We took granny back home with us and she read me some books, and then she went away again and the parent staff came home. I was feeling very tired by this time and I kept lying on the floor and sucking my thumb. Mummy picked me up and sat me on her knee and stroked my face and asked me what was wrong. I don’t think that she can have been very worried about me, though, because if she was then she wouldn’t have gone away to work and left me all day long. Mummy made me my dinner and gave me some bits of it on my spoon. I ate two bits of dinner and then I felt really poorly and I started to cry, so mummy picked me up and gave me a hug. Then I was sick. I have not been sick for a very long time and it made me very unhappy. I wanted mummy to know how unhappy I was so I put my arms around her neck and put my face on her shoulder, and then I was sick in her hair. Mummy had to stroke me and tell me that I was okay while daddy tried to mop the sick up very fast, which he did not do very well. It would all have been very funny if I had been feeling a bit better. Anyway, I soon stopped being sick and I started to feel a bit better, and then Harvey came in so I said “mim!” to him. After this I felt like I could play and have books again, and mummy ran me a nice cool bath and washed the rest of the sick off me. I drank my milk and I was not sick after this, so maybe I will be well again tomorrow. I am pleased that I saved up my sick for the parent staff, anyway. Maybe in future they will stay and play with me instead of going to work quite so much! Mummy got me up this morning, and we had to wait for aaaages for daddy to get up and come and play with us. Mummy said that this is because daddy was drinking his silly juice last night, so he needed to have a “lie-in”. When daddy has his silly juice it is usually when I am in bed, and when he gets up the next morning he looks like a troll from one of my books, and he speaks in grunts. When I am big I will not drink silly juice, because I want to stay pretty and not look like a troll. Daddy came in to play when me and mummy were in my bedroom getting dressed. He sat and talked to us and then his friend Sean came in to talk to us as well. Sean stayed at my house last night because he had been drinking silly juice with daddy. When Sean had gone home to his own house, the parent staff took me to the big shop to buy food. Mummy pushed the trolley and when she got the food off the shelves, she passed it to me to throw into the trolley behind me. Usually I would get the food into the trolley, but sometimes it would go on the floor instead and mummy would have to stop and pick it up. After the big shop we went back home and played for a long time. We played in the living room and in my nursery. Auntie Beccy came round after a while and she played with us too. She read me some books and in return I said her name for her: “Be – ty”. She was very pleased with this. When it was time for Auntie Beccy to go away again, mummy said that we would all go for a walk to the little shop and get some “tea-bags”. I know what a tea-bag is, because once when daddy was looking after me I found some in the cupboard and chewed them up. Auntie Beccy lives a few steps down our road, so we put her back in her house on our way to the little shop. Then we walked some more steps down the road and mummy and daddy held my hands and I was very good. In the little shop mummy got some tea-bags in a box, and I thought they would make good treasure so I took them off mummy and carried them back to our house in my hands. Only I thought it would be funny if I kept stopping and putting the tea-bag box on the floor, and then snatching it up again when mummy and daddy tried to pick it up. Mummy and daddy were cross about this, but actually it was very funny. Heh heh. When the parent staff put me to bed tonight they told me that I had been very good again, and they said thank you to me for giving them a lovely weekend. It has been a very nice weekend, actually. I will have lots of good things to dream about tonight. Today was a good day, because I got to be with gran and grandad while mummy was at “work”. Mummy goes to “work” on three days every week: two big days and one little day. While she is there, gran and grandad stay in our house and they are my staff. When gran and grandad are with me we do fun things, like going out for lunch and walking their dog, and visiting the library. The library is a magical place where loads and loads of books live, and when I go there I can choose some books that will come and live with me in my house for a while. When mummy had gone out today, me and gran and grandad took Molly for a walk in the park. Molly is gran and grandad’s dog. She is nice and I like her, but not as much as I like Harvey. We had fun in the park. It was sunny and there was lots of baby treasure to collect, and lots of dogs to talk to. After the park we went to the big shop, and gran and grandad took me upstairs and let me run around where the clothes are. I like this part of the big shop because there are long mirrors that have me in them. I kept taking gran over to the mirrors and pointing at mirror gran, and then pointing at mirror me, and then saying, “Gan. Geor-gia!” Gran was very impressed by how clever I am. In this part of the big shop there are also lots of very skinny, grey people, who are dressed in the clothes from the shop but who never move. Sometimes the grey people don’t have any hair. Gran calls them “man-e-kins” . I like the “man-e-kins”; they are funny and I try to get them to talk to me. I run over to their hands and offer to give them a high-five, but so far they never want to give me one back. I will keep trying whenever I see them. After we had done our shopping, we went to the cafe in the big shop and had snacks and drinks. While we were there we saw the boy who belongs to daddy’s cousin Rachel. He is called Iain and he is nice. He came over to talk to us and I showed him all the words I can say, and I gave him a high-five and a kiss. I was very tired by the time mummy and daddy came home ... so tired that I didn’t even want to eat all of my pudding after dinner. Tomorrow I will be with gran and grandad again. If we go back to the big shop, I will get a real high-five from a “man-e-kin”. Today I woke up and realised that I had been kidnapped. I had a fuzzy memory of being moved from daddy’s car to a strange cot in the middle of the night ... and when I opened my eyes this morning I was in a travel cot in a weird room. I didn’t really mind any of this because I soon realised that I have been to this place before, and I seemed to remember that there is a dog here ... and also the travel cot has more space in it than my home cot, which seems to have been getting smaller lately. So I did some talking, practising my animal noises and the words that I know in the staff language, until finally the door opened and I realised who the culprits of the kidnapping were ... MY OWN PARENTS!!! Mummy came in, with a sneaky look about her, and tickled my tummy and started babbling about how I was on holiday now and had come to visit Granny and Auntie Al. Granny and Auntie Al are all very well, but where was the dog that I remembered from last time? When mummy took me downstairs for breakfast the dog was there waiting. She is very very big and very very hairy and she is called Sherry. I like her very much. When I saw her I said “Wowowowow” and patted her. After breakfast and getting washed and dressed we went out to play in the garden and Sherry came with us. We sat on the grass and read books and Granny came out and took lots of pictures of me. I am getting very good at having my picture taken now. When Granny says “big grin”, I push my face forward and show her all of my teeth, and everybody laughs and claps because I am clever. Daddy came out to play too and because we were on the grass he did the whirly thing that he likes to do in grass places. He lifts me up high and then spins me round and round in a circle, and then he puts me back on the floor again and says “run to mummy!”, and I try to run to mummy but I am all wobbly, so I walk in a wobbly way and then fall onto mummy’s knees. This makes everybody laugh and clap as well, and I laugh too because it’s funny. After all of the playing we got in the car and went to the best place ever. It is a place called a “farm”, and it is full of dogs and pigs and sheep and ducks and other animals that I don’t know very well yet but that are still really cool. The first thing that I did when I got to the farm was run in to the place where all the pigs live and make an excellent pig noise. My pig noise was so good that all of the pigs made noises back at me. Pigs are so cool that I think I might like them even more than dogs. After the pigs, we went and gave food to some goats. The food was in a little bag that mummy had got from a man on the way in, and having food is really good fun because it means that all the animals want to be your friends. Mummy put some goat food in my hand and then put my hand on top of her giant hand, and then let the goats eat the food. The goats slurped up the food with their lips, and it was really tickly and funny. We had lunch on a bench at the farm. Mummy was cross because I kept spitting my cheese sandwich out when she fed it to me. I like sandwiches (they are really good fun to pull apart and play with), but this one was made with weird cheese and I didn’t like it at all. It was okay though because one of the farm dogs was under my seat and he was eating all of the sandwich that I was spitting out, and I think it made him happy. I had to eat a few bits of sandwich because mummy said that I couldn’t have my yogurt until I had eaten some. I wasn’t happy about having to eat the yucky cheese but I really wanted my yogurt. And my banana. When we had finished lunch the parent staff took me to a big pond where we saw ducks, and then a man let me have a ride on a donkey. This was a bit strange at first because I have never seen a donkey in real life before, but mummy kept hold of me all the time and it turned out to be pretty good fun. The donkey was nice even though he smelled a bit funny. There were some really good playgrounds at the farm. Some of them were outside and some of them had a roof. We went to an inside playground and it had big squishy things to jump on, and a room full of little balls that were all different colours. I made a friend in the playground. He was a boy and he was much bigger than me, but he was really kind and he let me put lots of little colourful balls on him and he helped me climb back out of the ball room when I was ready to go. Mummy said it was nice that I had made a friend. 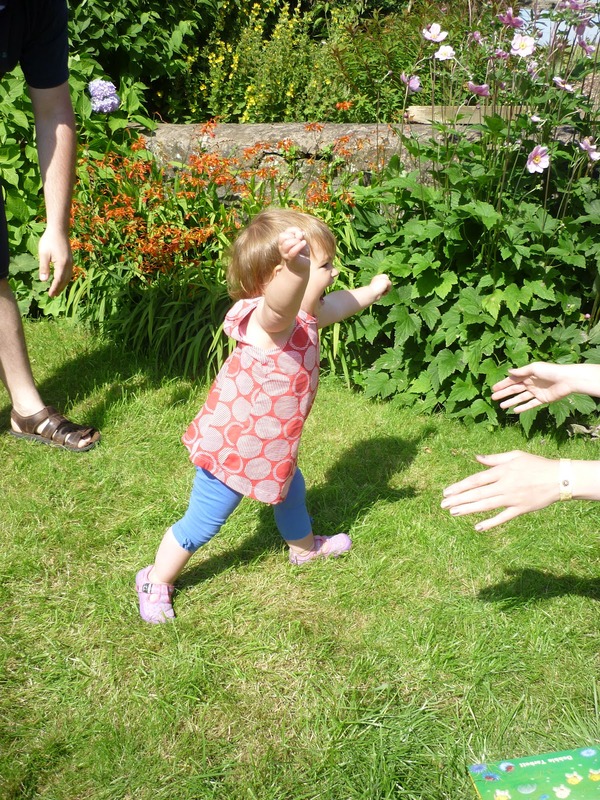 When we left the farm we went back to Granny’s house and played in the garden some more and had tea. I was feeling tired by this time because I had had a busy day, so when it was bath time I had a bit of a paddy and cried loudly whilst I was being dried. Mummy was a bit cross and she said that I wasn’t really crying because I had no tears in my eyes and was just making noise, but I think I still made my point. I was happy to get into my travel cot after story and milk time, anyway. Animals and farms are very tiring. Tonight I will dream about pigs. This morning daddy got me up while mummy was getting ready for work. When daddy gets me up it means that it will take a long time for me to have my breakfast and get washed. It also means that daddy will dress me in his favourite outfit of mine. This is a denim dress with a cat on the front. I like cats. My cat is called Harvey, and when I see him I say “mim”, because this is the noise that cats make. When daddy had finally got me washed and dressed, I played with my toys in the living room while daddy looked at the computer. Then he went into the kitchen to find food and I followed him. While he wasn’t looking I got Harvey’s box of food out of the cupboard. There is a small hole in the box that I can fit my arm in, and if I reach down far I can get biscuits out and put them in Harvey’s food bowl. I did this a few times before daddy saw me and told me off. I didn’t want to be told off, so to teach daddy a lesson I put a Harvey biscuit in my mouth, and then ran over to daddy and opened my mouth wide to show him. Daddy was very cross then and he put me on the upstairs landing, with all of the doors shut, for some “time out”. While I was having “time out” daddy’s phone rang, and I could hear him talking to mummy. I got excited about this so I started making animal noises so mummy could hear. I made a pig noise and I could hear daddy laughing, even though he was trying to be cross. In the afternoon daddy took me to the park on the bike, and we went on the swings. Then we sat in the big field and mummy came back from work and came to play with us. I ate some snacks and jumped on the parent staff and picked some flowers. At bedtime Harvey came into my room to listen to my story, and he said “mim”, which meant, “thank you for the biscuits”. I will give him more biscuits tomorrow. In the end daddy took me out in my special seat on the bike and we went to the promenade and walked by the sea and played on the playground. The sun was shining and it was very busy. After a while mummy came out in the car to pick me up, and I showed her some baby treasure that I had collected. There were some flowers that I had liked the look of, that didn’t have many petals any more. Mummy got very excited when I showed her these. She made gushy noises and gave me a big hug and told me that I was very kind because I had brought her flowers. They weren’t even for her, she just stole them out of my hands! Grown-ups are strange. When we went home I had Sunday roast for my tea. While I was sitting in my highchair I pulled my bib off lots and said “bib”. Mummy finds it difficult to tell me off for this because even though I am getting dinner all down my front, she is very happy that I am saying a word in the staff language. Overall it has been a good day. Mummy said that daddy is looking after me tomorrow, because he isn’t working till the night time. That should be fun.